The Lower Granite Dam tailrace temperature is holding at around an average of 66 degrees Fahrenheit, a couple of degrees lower than the maximum 68 degree water temperature set by a NOAA Fisheries biological opinion for Columbia/Snake river salmon and steelhead. In addition, the amount of water released from Dworshak Dam is on target to result in an elevation of 1,534 to 1,535 feet at the end of August. The required Dworshak reservoir elevation of 1,535 feet is to ensure there will be enough cold water for salmon migrations in September and into the fall. This is all good news for fishery managers charged with providing cooler water for migrating adult and juvenile salmon when they need it. Shorter days, cooler temperatures, a chance of rain and less solar radiation due to the heavy smoke from wildfires in the Northwest will likely help keep the Lower Granite temperature lower than 68 degrees for the next week, according to Steve Hall of the U.S. Army Corps of Engineers' Walla Walla office. Still, NOAA Fisheries this week had asked to extend the drawdown of Dworshak Reservoir one extra foot to an elevation of 1,534 feet in order to aid trapping of endangered Snake River sockeye at Lower Granite Dam. The incremental increase in Dworshak flow, taking the reservoir lower, should help keep the lower Snake River cooler for trapping operations, according to Paul Wagner of NOAA Fisheries. "This should help the Lower Granite reservoir. The forebay does heat up during the day, limiting the operation of the sockeye traps on some days," said Wagner. "So, this will help in maintaining the temperature in the forebay." Dworshak Dam, which until today has been releasing water at the rate of about 5,000 cubic feet per second, is on the North Fork of the Clearwater River. The Corps is dropping outflows to about 4.8 kcfs today. At this flow, modeling is showing that the water temperature at Lower Granite should not exceed BiOp levels through August 31, Hall said. Hall also expects the reservoir elevation to end the month closer to 1,535 feet than to 1,534 feet. "Yesterday (Tuesday this week), Dworshak drafted about a half a foot and with three feet to go, that's six days left to the end of the month," he said. The Corps could still bump the discharge to get closer to NOAA's request to end the month at an elevation of 1,534 feet. There is also a generation requirement from the Bonneville Power Administration's transmission group to use power house number one at Dworshak. That could bump flows to above 5 kcfs, Hall said. For the most part, river and fisheries managers at the Technical Management Team have kept Lower Granite tailwater temperatures below the 68 degree limit during August. This year managers have particularly targeted sockeye passage at the dam and have set up the trap and haul program to collect sockeye and transfer them to the Eagle Hatchery near Boise. Redfish Lake sockeye, the southern-most population of sockeye salmon in the world, swim 900 miles from the Pacific Ocean to a 6,500-foot elevation in central Idaho's Sawtooth Basin to spawn. Through Wednesday, August 26, 413 sockeye had passed Lower Granite Dam about 30 miles from Lewiston, Idaho and 90 have been trapped at three trapping locations. Some 33 have been trapped at the Redfish Lake Creek trap, 6 at the Sawtooth Fish Hatchery trap and 51 at the Lower Granite Dam trap. As of August 25, the Fish Passage Center reports that overall 510,552 sockeye have passed Bonneville Dam, up slightly from July 29 when 508,389 sockeye were counted at the dam. Most of the sockeye were headed to Central Washington, but counts have progressively diminished upstream, to 429,413 (July 29 was 426,136) at The Dalles Dam and 278,464 (274,276 on July 29) at McNary Dam. Only 186,200 have arrived at Wells Dam in the mid-Columbia River. For Snake River sockeye, as of August 25, 1,047 (up from 1,027 August 13) were counted at Ice Harbor Dam, 885 (873 Aug. 13) at Lower Monumental Dam, 573 (558 Aug. 13) at Little Goose Dam, and just 413 (403 Aug. 13.) at Lower Granite Dam. When Idaho sockeye were listed in 1991 under the federal Endangered Species Act, only four adult sockeye returned to the Sawtooth Basin. 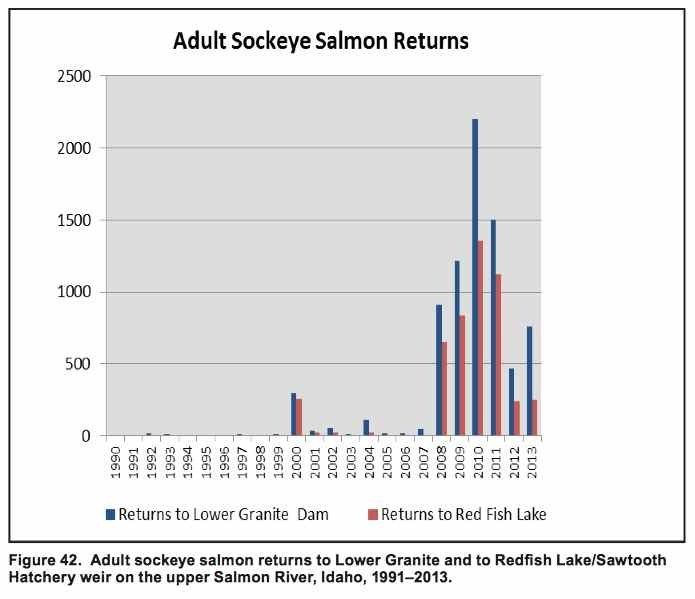 The combined annual returns from 1991-99 was 23 fish, including two years when no sockeye returned to Idaho. Trapping and transporting sockeye is one of many safeguards IDFG implemented to restore the Snake River sockeye population. Another safeguard is IDFG's captive breeding program, which raises sockeye from egg to adult in a hatchery, foregoing the trip to the ocean. The program ensures that regardless of how many adults return this summer, the agency will still be able to ramp up its release of juveniles in the spring.